NOTE: This content is old - Published: Friday, May 4th, 2018. The Welsh Football Association’s plans for Colliers Park have got the go ahead from councillors, with the main complaints being based around clear signage on the A483. In February 2018 Wrexham.com reported that the FAW (Football Association of Wales) and Wrexham Glyndwr University had unveiled plans to create a new National Football Development Centre in Wrexham. The new National Development Centre at Colliers Park in Wrexham would complement the FAW existing facility at Dragon Park, Newport and they say would ‘further benefit Welsh football nationally and locally’. Colliers Park is the former Wrexham Football Club training ground, with Wrexham Football Club previously owning both the Racecourse Ground and Colliers Park. Colliers was built at a cost of £750,000 to the club back in 1997. Barcelona famously used the site for training, which at one point was regarded as one of the best outside the Premier League however in recent years has lost its lustre, as well as moving from the football club’s ownership due to the actions of previous owners. 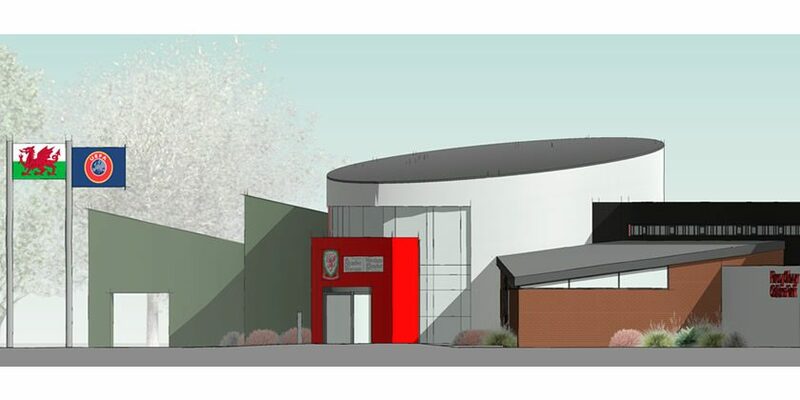 The FAW’s new plans for the site include upgrading and extending the existing facilities to include two new pitches, one with floodlighting and a 3G pitch; a small spectator stand and an extension to the existing building to provide accommodation facilities. There would also be an educational element provided as part of the tie in with Wrexham Glyndwr University. On Tuesday plans for the development at Colliers Park were welcomed by planning committee members, who voted in favour of the application progressing to the final stage once the consultation process was complete. Speaking at the meeting, Wrexham Council’s Planning Control Manager David Williams said: “In terms of history of site there was a permission granted on appeal in 1999 which restricted the number, there been concerns raised in respective about competitive matches and games on site. “There was an application refused by committee went to appeal in 1999 for such a use, and the inspector minded to support it and in supporting imposed a restriction of 200 spectators on the site. “The Football Association of Wales are quite happy to see that condition repeated to ensure that the scale and intensification is controlled to a certain degree. “Having said that in terms of parking have provided well in excess of the maximum provision. If you apply your own parking standards to this development it would require a maximum of 35 spaces – they are providing 55 and scope for overspill if necessary. “However given the restriction of no more than 200 spectators on site I wouldn’t envisage any overspill on Gresford Road and no indication there would be major matches played at the venue. “The other concern raised through community is the approach buses may take in accessing the site. There is concern they may turn off at Rossett Roundabout and via Marford and Gresford. I don’t think will be case. Cllr Andrew Atkinson, who represents the Gresford ward, described the plans as a ‘really exciting development and exciting plan for football in the area and across Wrexham’ and noted that his and the community council’s concerns about “appropriate mitigation” had been addressed. He also asked if it would be possible for signage on the A483 for those who are unaware of the area and how to get to the site. Cllr Atkinson said: “If people don’t know the area and approach from the Chester site, they can turn off at Rossett and end up via Marford and drive through Gresford to get to the site and that’s if they don’t know the area. “Ideally as I said that I think this would have very little impact on my ward if people are travelling to Colliers Park and came off at Gresford Roundabout and arrives immediately at the destination and goes back in that direction. “We can’t control who uses the public highways, but I didn’t feel it was a big ask for a development of this size for a sign on the A483 at the developers expense that says Colliers Park at the next turn off. Calls for signage on the A483 were also requested by Cllr Paul Roberts, who said: “I agree with what Cllr Atkinson is suggesting. If we are talking about numbers of 200 spectators, three pitches, three sets of players and back up staff, it’s 200 spectators plus potentially another 200. “It is meant to be a flagship enterprise by the FAW, for the sake of a small amount of money I’m sure they could we put up suitable signage that is quite professional. It was clarified to the committee that the condition related to 200 people – including players, visitors and training officials – in total at the site at one time, not 200 spectators. Cllr Paul Pemberton, in moving the recommendations to press ahead with the plans, described it as “football coming home as far as Wrexham is concerned”. He continued: “It has been a hell of a facility for the area. It’s had the England team train there and Barcelona, it’s been well used. Cllr Pemberton used the meeting, the very same committee of Wrexham Council that took a ‘gamble’ that was clearly lost in terms of the football club (more on that here) to comment: “The tragedy is Wrexham Football Club had it taken off them by unscrupulous developers and I must emphasise they were unscrupulous. “As a consequence the university have taken over, it was a bit of a lifeline but has done no good for our club which is training on Nine Acre. “With the Welsh FA I can remember them on Fairy Road, it was their home for many years. I welcome this, football is coming home as far as Wrexham is concerned. Wrexham was always the home for Welsh football. The comments were echoed by Cllr Derek Wright, who said: “I live just below the Druids ground and since the 3G pitch has been there and the way that has been used, with the amount of people who use it and used for kids training. It has been a real bonus to our area. “It is also keeping sports facilities in Wrexham, I think too too many of them have been lost to development. It can only be good if its maintained and not only maintained but improved vastly with quite a lot of money spent on it. The committee voted unanimously in favour of the report. Tuesday’s vote means a further decision will be made by the Head of Environment and Planning, Lawrence Isted, via a delegated decision once the consultation period has ended and if no new planning issues are raised.